Mark A. Bedau, John S. McCaskill, Norman H. Packard, Steen Rasmussen, eds. 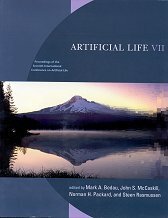 Artificial Life VII: proceedings of the seventh international conference on artificial life, Portland OR. Russell K. Standish, Mark A. Bedau, Hussein A. Abbass, eds. 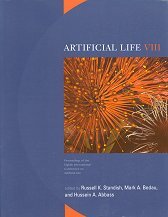 Artificial Life VIII: proceedings of the eighth international conference on artificial life, Sydney, Australia. Jordan B. Pollack, Mark A. Bedau, Philip Husbands, Takashi Ikegami, Richard A. Watson. 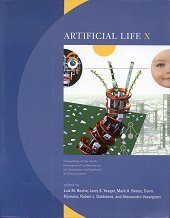 Artificial Life IX: proceedings of the ninth international conference on artificial life, Boston, USA. Luis Mateus Rocha, Larry S. Yaeger, Mark A. Bedau, Dario Floreano, Robert L. Goldstone, Alessandro Vespignani. 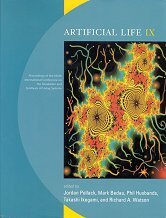 Artificial Life X: proceedings of the ninth international conference on artificial life, Bloomington, USA. Mark A. Bedau, Paul Humphreys, eds. Emergence: contemporary readings in philosophy and science. Steen Rasmussen, Mark A. Bedau, Liaohai Chen, David Deamer, David C. Krakauer, Norman H. Packard, Peter F. Stadler. Protocells: bridging nonliving and living matter. Protocells offers a comprehensive resource on current attempts to create simple forms of life from scratch in the laboratory. These minimal versions of cells are entities with lifelike properties created from nonliving materials; the book provides in-depth investigations of processes at the interface between nonliving and living matter. Chapters by experts in the field put this state-of-the-art research in the context of theory, laboratory work, and computer simulations on the components and properties of protocells. The book also provides perspectives on research in related areas and such broader societal issues as commercial applications and ethical considerations. The book covers all major scientific approaches to creating minimal life, both in the laboratory and in simulation. It emphasizes the bottom-up view of physicists, chemists, and material scientists but also includes the molecular biologists top-down approach and the origin-of-ljfe perspective. Ihe capacity to engineer living technology could have a enormous socio-economic impact and could bring both good and ill. Protocells promises to be the essential reference for research on bottom-up assembly of life and living technology for years to come. Mark A. Bedau, Emily C. Parke. The Ethics of Protocells: moral and social implications of creating life in the laboratory. Teams of scientists around the world are racing to create protocells – microscopic, self-organizing entities that spontaneously assemble from simple organic and inorganic materials. The creation of fully autonomous protocells – a technology that can, for all intents and purposes, be considered literally alive – is only a matter of time. This book examines the pressing social and ethical issues raised by the creation of life in the laboratory. Protocells might offer great medical and social benefits and vast new economic opportunities, but they also pose potential risks and threaten cultural and moral norms against tampering with nature and “playing God.” The Ethics of Protocells offers a variety of perspectives on these concerns. After a brief survey of current protocell research (including the much-publicized “top-down” strategy of J. Craig Venter and Hamilton Smith, for which they have received multimillion dollar financing from the U.S. Department of Energy), the chapters treat risk, uncertainty, and precaution; lessons from recent history and related technologies; and ethics in a future society with protocells. The discussions range from new considerations of the precautionary principle and the role of professional ethicists to explorations of what can be learned from society’s experience with other biotechnologies and the open-source software movement.